4. 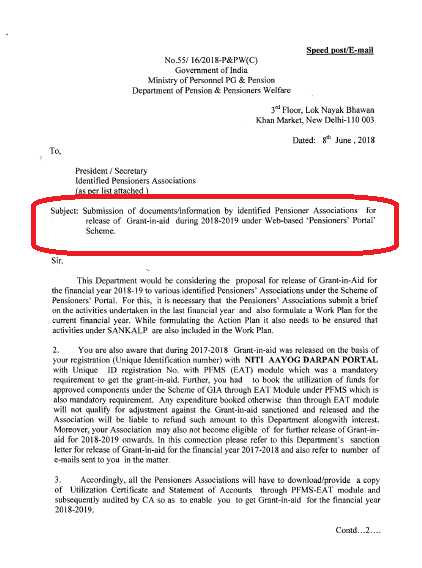 In view of the above, all the identified Pensioners’ Associations are requested to submit the above stated information alongwith requisite documents latest by so” h July, 2018 positively so as to enable for this Department to release the Grant-in-Aid for the financial year 2018-19 well in time. Pensioners Associations will have to download/provide a copy of Utilization Certificate and Statement of Accounts through PFMS-EAT module and subsequently audited by CA so as to enable you to get Grant-in-aid for the financial year 2018-2019.